While under-building and population growth can explain some of the home price appreciation, this is unlikely to be the only explanation because house prices have risen faster than rents or incomes. We observe very low real mortgage rates and buying activity based on consumer expectations for additional price increases – both consistent with conditions that signaled housing bubbles in the past. 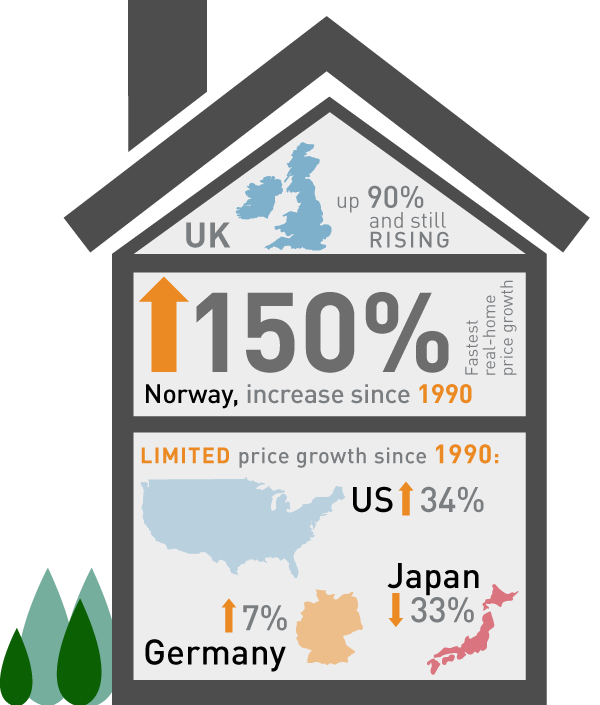 The fastest real home price growth has taken place in Norway (150% increase from 1990 price levels), Sweden (120% increase) and Australia (120% increase). The US housing market peaked in 2006 with real prices 57% above the 1990 level and prices vs. rents and incomes were 20-30% above long-term trends. US housing appeared less over-valued than select countries discussed above, but a deep recession and a contraction in mortgage credit still drove US national home prices down 25-30% between 2006 and 2011. The UK (up 90% from 1990) is still rising due in part to foreign investment in London property, while France (up 80%) began declining in 2012. Spain is an example of a country that had an unsustainable increase followed by a correction. Spanish real house prices peaked in 2007 with a 110% increase from 1990 level but then declined by 40%. Currently, they are only 30% above 1990 level. The response of central banks and other policymakers to potential over-valuation in housing is a key variable that makes timing and size of corrections difficult to estimate. Policymakers, including financial supervisors, in several countries have expressed concern about housing overvaluation and have attempted to address this through macro-prudential measures including reducing loan-to-value or the debt-to-income at which banks are able to lend. At the same time, central banks have kept rates very low (at zero or below in nominal terms in some of these countries, and severely negative in real terms) due to overall economic weakness or to influence the currency flows. These negative real rates have supported a housing boom. It is difficult to know what level of over-valuation can be supported by zero rates and for how long. We estimate that once rates stop declining, lack of affordability can drive prices down without actual rate rises, but we are clearly in unchartered territory. These levels of above-trend prices and large price increases in real terms are similar to where we saw Netherlands, Denmark and Spain peaking in 2007-2009. Very soon after, the housing markets in these countries began +20% home price corrections.